I’ve always enjoyed book signings. 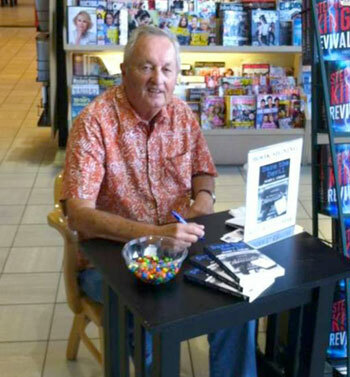 At a recent highly successful one at a Barnes & Noble in Manhattan Beach, California, I had a pleasant conversation with Terry Dillon, a man originally from Chicago. We talked about my latest book, “Dare the Devil,” which has a film noir taste to it. You signed your book for me recently at Barnes & Noble in Manhattan Beach. I am the guy from Chicago and we talked about the Daily News and “Double Indemnity,” the greatest of all noirs. I must say, once I got comfortable with your characters, this was a compelling page-turner for me. I absolutely could not wait to see how each of the plot threads (crime and spies) would turn out and if or how they would be related. I greatly appreciated your characters’ attitudes on racial and religious and cultural diversity. I wholeheartedly agree! Also, being 71 years old, I enjoyed and recognized all the references to the people, events and pop culture of the postwar years. I will seek out your other works for sure. Thank you so much for this nostalgic adventure!